A unique venue in the heart of rural Oxfordshire. The perfect setting for your big day with breathtaking views over the surrounding countryside. Welcome to Bo Peep Farm, home of Dovecote Barn, a stunning wedding venue in an exclusive rural Oxfordshire location with vistas of rolling hills, fields and rivers. Dovecote Barn is a Grade II listed building, full of character and charm with exposed brickwork and oak beams. Formerly known as Park Corner Barn, it dates back from the 18th Century and was part of the Adderbury House estate, built by the Duke of Argyll. After being tastefully restored, Dovecote Barn is now licensed for civil ceremonies, partnerships ceremonies and the renewal of wedding vows and aims to provide the perfect setting for your wedding. 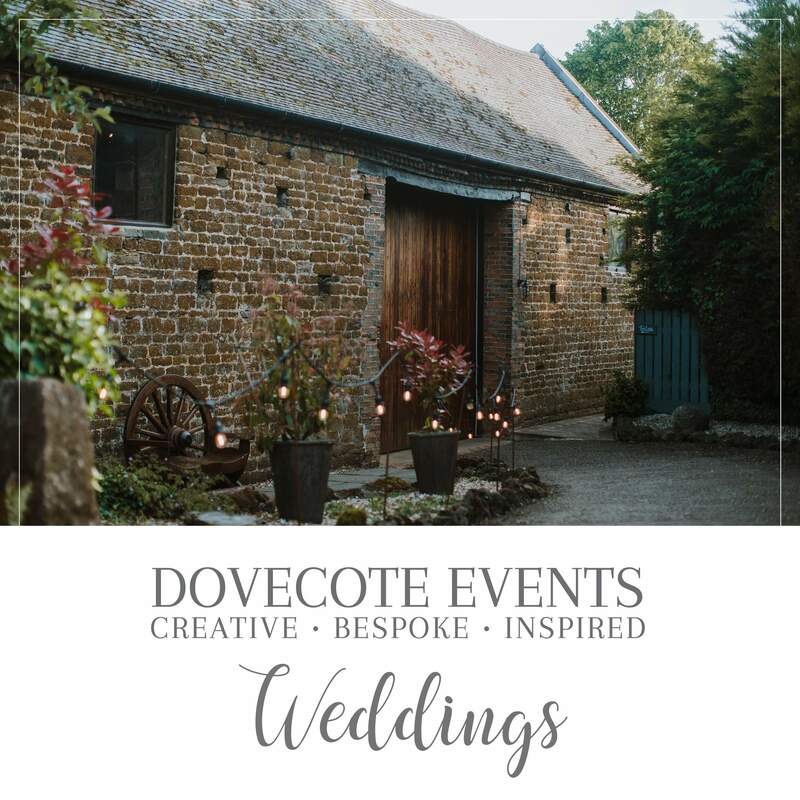 Dovecote Events is a family-run business offering a personalised and friendly service, working closely with you to make your day one to remember for all the right reasons. Download our brand new 2019 Wedding Brochure! Dovecote Barn is licensed for civil ceremonies, partnership ceremonies and vow renewals, accommodating up to 100 people. The layout of the barn allows flexibility with regard to seating arrangements, and the gallery allows an advantageous position for photography. On the day, the registrars arrive in advance ensuring the wedding party is prepared and ready for the ceremony. There is ample space for guests to gather before the main barn door is opened shortly before the ceremony commences. Guests will then be invited to take their seats prior to the arrival of the bridal party. Registrars can be booked directly with Oxfordshire Registration Service on 0345 241 2489. Dovecote Barn can be hired for a ceremony only or part of a whole day of celebrations. If you plan to continue your day with us at Dovecote Barn, or if you arrive after a church ceremony, our staff will welcome you and your guests to our walled courtyard to enjoy drinks and perhaps some tasty canapés. In colder months, relax in the heated marquee that adjoins the barn. Head back into Dovecote Barn where the room will be transformed for your wedding breakfast, catering for up to 100 people. Catering is provided by our in-house chefs and our event managers will be there every step of the way to assist with everything from the venue to the food. Dovecote Barn can be transformed once again ready to host your evening celebrations. Dance the night away to your favourite tunes from our recommended DJ or feel free to book your own entertainment. For larger celebrations why not take a look at holding your reception in our marquee or tipi? Bo Peep Farm is home to beautiful and extensive grounds, perfect for larger wedding gatherings. Our marquees are built to suit your party size, accommodating 80 to 200 guests. Bo Peep Farm has ample parking for guests and fantastic areas if guests wish to camp on the night of the wedding. Get in touch with our event managers to find out more about our marquees and prices. Dovecote Events is now the proud owner of a stunning two-hat tipi, situated in its own exclusive setting at Bo Peep Farm. Surrounded by acres of green fields with space for parking and for guests to camp on the night of the wedding you really will be able to create your own festival-style wedding. The tipi can accommodate up to 120 people for dining and up to 150 guests for the evening reception. Take a look through our image gallery for inspiration, or get in touch to arrange a visit and discuss your ideas with one of our event managers.